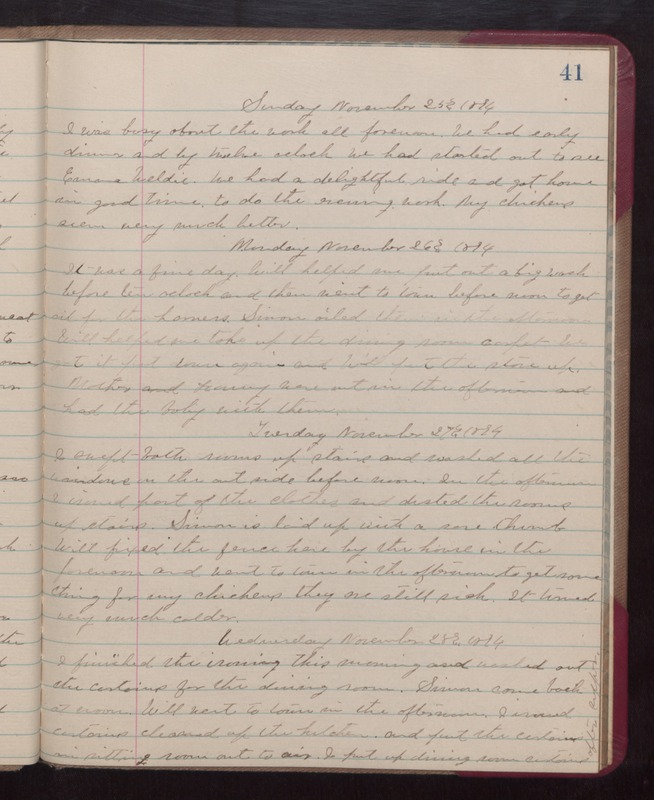 Sunday November 25th 1894 I was busy about the work all forenoon. We had early dinner and by twelve oclock we had started out to see Emma Weldie. We had a delightful ride and got home in good time to do the evening work. My chickens seem very much better. Monday November 26th 1894 It was fine day. Will helped me put out a big wash befoe ten oclock and then went to town before noon to get oil for the harness. Simon oiled them in the afternoon. Will helped me take up the dining room carpet. We got it put down again and Will put the stove up. Mother and Fanny were out in the afternoon and had the baby with them. Tuesday November 27th 1894. I swept both rooms up stairs and washed all the windows on the outside before noon. In the afternoon I ironed part of the clothes and dusted the rooms up stairs. Simon is laid up with a sore thumb. Will fixed the fence here by the house in the forenoon and went to town in the afternoon to get some thing for my chickens they are still sick. It turned very much colder. Wednesday November 28th 1894 I finished the ironing this morning and washed out the curtains for the dining room. Simon came back at noon. Will went to town in the afternoon. I ironed curtains, cleaned up the kitchen, and put the curtains in sitting room out to air. I put up dining room curtains after supper.